Do you ever use bookmarks in your web browser, but can only access them from one computer? Or get annoyed because you can’t remember how to find a great activity you saw on a site which would be perfect for this afternoon’s lesson? If the answer to either of those questions is ‘yes’, diigo could be the answer. Sign up for a free diigo account at diigo.com. Add as many tags as you can think of. The more you add, the easier it will be to find the page again later. You can also add a description of the page, or include a quote which you want to refer to later. The ‘Annotate’ option in the menu in step 2 also lets you add highlighting in different colours to the page, which is particularly useful for research. Click the blue ‘Save’ button at the bottom of the window. A red ribbon appears on the diigo logo to show that it has saved successfully. You can also share bookmarks with other people using direct links, so https://www.diigo.com/user/sandymillin/delta takes you to all of my bookmarks with the ‘delta’ tag. I’ve used this function with students by tagging a set of videos I wanted them to watch, then sharing the link. It’s much faster than giving them five different links! 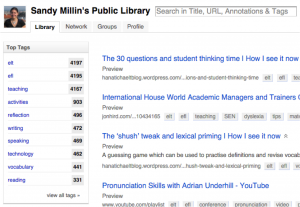 Of course, diigo isn’t the only site you can use for online bookmarking. Other options are Evernote and Delicious. I like diigo because of how easy it is to use, and particularly to share links with other people, and all of the functionality I need it for is currently free. 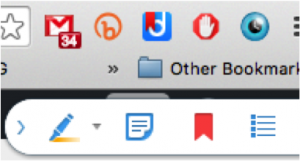 If you change your mind about which site you want to use or want to have a back-up, it’s easy enough to download all of your bookmarks from diigo and upload them to one of the other sites. 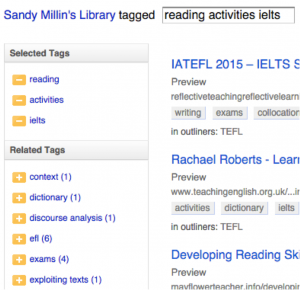 I hope you can see how useful online bookmarking is as it makes your bookmarks accessible from any computer, tablet or phone, and can be used to enhance your own professional development or with your students in class. Good luck! Author’s Bio: Sandy Millin has just started work as the Director of Studies at IH Bydgoszcz in Poland. She was previously the DoS at IH Sevastopol, a much smaller school. She is hoping that she asked the right questions of herself before she agreed to do take on this much bigger task! She will be blogging about her experience at http://sandymillin.wordpress.com. You can tell her what questions she missed by tweeting her @sandymillin.